In the event of an emergency, it’s critical to be as prepared as possible. That’s why Microsoft created the family emergency plan template. With the emergency plan template, you can decide where you will go and how you will get in contact with one another in case the worst happens. This incredible template is available to you at no charge. You can download the emergency plan template instantly by clicking the link available on this page. The emergency plan template is a two-page Microsoft Excel workbook. The first page consists of the family emergency plan, while the second is made up of printable emergency cards. The family emergency plan template is completely customizable, so feel free to add or remove information as necessary. The first step in filling out the family emergency plan is to determine meeting places in the event of an emergency. You will decide on a primary and secondary meeting place, as well as list out of town instructions. Next, add the name, social security, date of birth and important medical information for each member of the family. It’s very important to keep all of this information current and up to date. The next step in filling out the family emergency plan template is to add where your family spends time the most, such as work, school or other places you or your family may frequent. Next, add your insurance policies and their contact information. Homeowner’s and auto policies are examples of what you should add to the template. The second page of the family emergency plan template includes six printable emergency cards. One side will feature the meeting places you outlined earlier, while the other is reserved for any additional instructions for family member you may have. In the event of an emergency, it’s crucial to have a plan. Download the family emergency plan template from Microsoft today and be prepared. 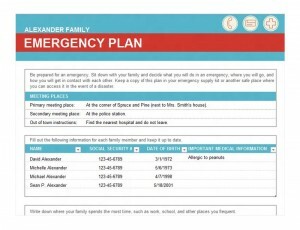 The emergency plan template from Microsoft is free courtesy of MyExcelTemplates.com!